No matter which units you may choose from the complete Wonder-Boy mower line, you can be sure of two things. Fast, easy mounting - without any tools. And precision performance the result of Simplicity Engineering. A combination no one can beat. 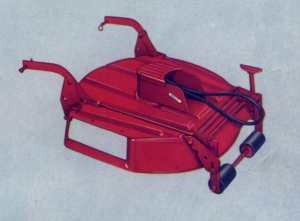 32" DELUXE ROTARY MOWER with Leaf Mulcher (For Model 600) (Mfr. No. 990244) Heavily reinforced housing of bumper weight steel. One-piece blades are tempered, high carbon steel. Shafts revolve on pre-sealed ball bearings. Full-flex hitch follows ground contours. Single lever adjusts cutting height 1-1/4" to 3". Long-lasting rubber gauge rollers. 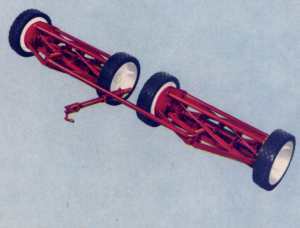 24" ROTARY MOWER (For Model 400) (Mfr. No. 990236) Heavy gauge all steel, deep housing. Large opening eliminates clogging. One control for overall height adjustment for front and rear. One-piece blade is high carbon steel. Shaft rotates on precision ball bearings. Free Floating hitch follows ground contours. Cutting height adjustable from 1-1/2" to 2-5/8". Long-lasting rubber gauge rollers. 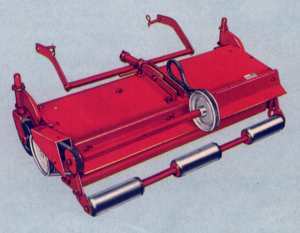 30" DELUXE REEL MOWER (For Models 600, 400) (Mfr. No. 990183) Five cutting blades - 6" diameter reel. Full-Flex hitch to follow ground contours. Cutting height adjustable from 1/2" to 1-1/4". Two caster wheels prevent scalping. Rigidly-supported steel bed knife. Heavy steel construction. 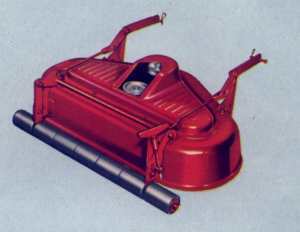 HEAVY DUTY GANG MOWERS (For Models 600, 400) (Mfr. No. 990123) Used with 30" reel mower to cut a 59" swath. Mowers are 21" ground driven. Cast iron frame provides rigid support. Five-blade reels are formed of alloy steel. Precision tapered roller bearings throughout. Wide rubber tires provide traction to drive cutting blades through heavy grass. Single pin attachment for easy removal when cutting in close areas.